This is the dish for July’s Recipes to Rival challenge chosen by our hostesses, Belita of Culinary Adventures and Lori of Lipsmacking Goodness. Recipes to Rival is a monthly food blogging event conceived in the spirit of The Daring Bakers where the host or hostess chooses a recipe and everyone in the group makes it and posts about the experience at a prearranged date. According to Belita’s introduction of the recipe, “Thank George’s Bank”, from The Black Dog Summer on the Vineyard Cookbook, “is to honor George’s Bank, a bank on the outer continental shelf of the Gulf of Maine.” This recipe consists of three parts, a fish cake base, poached egg and hollandaise sauce. We just happened to have grilled some trout for our Fourth of July cookout, so I had some leftover fish. So while the recipe calls for cod, I substituted with trout and it was delicious! We will certainly be cooking this recipe again so maybe next time I will use cod as the recipe called for. Making this dish presented a couple of ‘firsts’ for me. 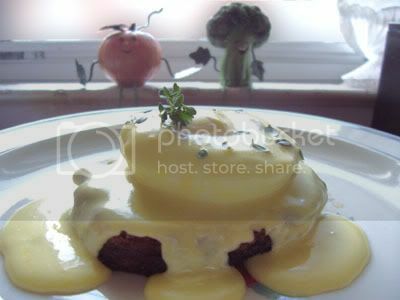 It was the first time I poached an egg and it was also the first time I made hollandaise sauce. I had my doubts at first because the one and only time I had poached egg with hollandaise sauce, I didn’t like it. The sauce was yellow and gross and the egg was tough and rubbery. I see now how badly cooked that was. Following this recipe, with only slight modifications, I ended up with something short of sublime. The Hollandaise was rich and buttery, slightly tangy from the lemon and just a hint of tabasco in the background. The hollandaise is, in my opinion, what carries this whole dish together. Since I am scared of raw eggs, I used the second version of heating the sauce over a double boiler. I thought the amount of butter was a bit much, so I reduced it by half (about 6 tablespoons). The sauce started to get too thick for me so I added more like a couple of tablespoons of hot water rather than just drops. I noted the changes I made in brackets on the recipe below. Check out how other Recipes to Rival members cooked this dish by visiting the Recipes to Rival Blogroll. If you’d like to join in the fun, visit the Recipes to Rival Forum to learn how. The original challenge recipe is now posted here and reposted below with my changes. To prepare this dish, you will first need to prepare some fishcakes and hollandaise sauce. These fishcakes are a popular Black Dog alternative to bacon or sausage. These are excellent for using up leftover potatoes! 1. If you don’t have leftover mashed potatoes, peel and dice two large potatoes. Boil in salted water for about 20 minutes or until soft. Mash and set aside. 2. Place fish in a steamer, cover with diced onion and seasonings. Cover and steam for 10-15 minutes or until the onion is cooked. 3. In a medium bowl, combine cooked fish and seasoned onions with the mashed potatoes. Mix in the egg and cream, divide into four patties. 4. Sauté the fishcakes in a sauté pan in butter over medium heat until browned. 1. Combine egg yolks and lemon juice in the bowl of a food processor. 2. Turn on the food processor and slowly add the melted butter. 3. Allow to run until the sauce emulsifies. 4. Add Tobasco, salt, and cayenne pepper. 1. Over low heat, melt the butter. 2. Skim the foam off the top and keep warm. 3. In a double boiler (or a bowl on top of a saucepan), place the egg yolks and water. 4. Off the heat, beat the yolks with a whisk until they are light and frothy. 5. Place on top of saucepan or double boiler and whisk continuously until eggs are thickened, 3-5 minutes, making sure the eggs don’t get too hot. 6. Pour into a separate bowl to cool, and while whisking continuously, slowly add the butter, omitting the milk solids. 7. Whisk in the lemon juice, hot pepper sauce, salt, and white pepper. 8. If sauce is too thick, add a few drops warm water. 9. Serve immediately or you can keep it warm up to 30 minutes by placing the bowl in warm water. 1. Prepare fishcakes and hollandaise sauce. 2. Fill a large saucepan with water and bring to a boil. Add white vinegar and reduce the heat to a simmer. 3. Crack and gently drop in the eggs. 4. Simmer about 3-5 minutes or until whites are firm and yolks are done to your likes. 5. To serve: place each poached egg on a fishcake, cover with hollandaise sauce. Serve with your favorite breakfast sides. Additional note: the second time we made it, we had grits with it and it was delicious! Seafood is one of my all time fave foods. What a delicious way to serve it. Cod and trout are so yummy too. That sure does look good. Now I have to go look at all the others. fabulous, I love the pictures. Yours looks so rich and tasty! Great job working with what you have on hand. Hallandaise is usually what gives dishes that extra something something! Especially if it is cooked right. Great job and awesome photo! That is a beautiful photo. I do believe the hollandaise carried this recipe as well. However the fish cakes did taste good the next day for lunch with some mayo on them as well. I’m glad you enjoyed them! I’ve never really eaten trout before, but I’m sure it would be just as good. Thats the first time one of those security words has actualy been a word. For some reason this impresses me. The trout sounds like a great idea! It looks scrupmtious. Great job! I’d like to keep trying different types of fish. Trout would be a good place to start.